People with sensitive teeth and gums experience sharp or radiating pain after eating hot or cold foods or sweets. Even routine dental care tasks like brushing and flossing can cause misery. 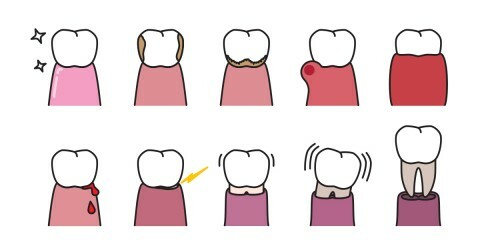 Tooth sensitivity can result from a variety of causes; these include worn tooth enamel, exposed roots, cavities, chipped or cracked teeth, infection, bleaching products, and even routine dental procedures. The good news is that the condition is treatable, and you can learn how to help sensitive teeth symptoms at home. The following tips on how to help sensitive teeth and gums will get you started. Brush twice a day with a soft toothbrush. Avoid brushing your teeth too hard or too often. Try over-the-counter desensitizing toothpastes. These products can often help block the pain associated with tooth sensitivity. Ask your dentist in Indiana about using a fluoride mouthwash or having professional fluoride treatments. Limit the consumption of acidic foods such as carbonated beverages, citrus fruits, yogurt, and wine, and brush immediately after consuming them. When you can’t avoid acidic beverages, use a straw to reduce direct contact with tooth surfaces. If you tend to grind your teeth at night, ask your dentist about using a mouth guard. If your sensitive teeth and gums are caused by a dental problem like tooth decay or a cracked tooth, you’ll need professional dental care. If home remedies fail, see your dentist in Indiana as soon as possible. Common professional treatments include application of dental sealants to cover exposed roots of sensitive teeth and root canal treatments in cases where extensive damage is present. To get the dental care you deserve from an affordable dentist in Indiana, call Wadas Dental today at (866) 881-7554 or make an appointment. Wadas Dental offers affordable family dentistry and gentle, compassionate dental care in Indiana. Our offices are conveniently located with extended hours to meet your needs. At Wadas Dental, we provide most dental services, from basic preventative care and general dentistry to specialized procedures and complete dental reconstruction. We accept most dental insurance plans and offer affordable financial solutions for any budget. Patient satisfaction is our top priority and we strive to provide the exceptional, affordable dental care and personal touch that lead to lasting relationships. A smiling patient is our greatest reward and we look forward to keeping those smiles healthy, beautiful, and bright. Discover an affordable dentist who truly cares at Wadas Dental. I am comfortable with the quality of care and the expert service. Dr. Cooper is great, he thoroughly explains things and is quick and efficient. All the staff are always pleasant, whether on the phone or in person. I love this place! Very fast! Staff is super sweet!!! As always, courteous and professional. Everyone makes be feel comfortable. I. Had the same dentist my whole life and had to change because he retired. I’m definitely happy with my dentist now.